Regan with her dog, Raxl, a Chihuahua. At our first appointment, I will gather information about your dog's medical history, personality and lifestyle. I will also perform a visual and physical assessment (including palpation, visual assessment from the front, back, and both sides of your dog while the dog is standing, and while the dog is walking and jogging) . This is followed by a short "overall" Swedish massage session to introduce your dog (or cat) to therapeutic touch. We will then discuss a treatment plan and future sessions. We will proceed with the treatment plan and discuss any changes in your dog's or cat's health or behavior. We will also discuss the continuing treatment process and home care recommendations. It is essential that you keep me informed if there has been a change in your pet's health that may be worsened by massage or might threaten the health of other clients (illness, contagious disease, parasites). Please check my Precautions and Informed Consent page for more information. Be sure your pet has not eaten more recently than 90 minutes prior to his massage session. Make sure their bowels and bladder are as empty as possible prior to their arrival for their appointment. Also, please make sure your dog is dry and free of excess mud. Your dog must not have fleas or ticks, or be suffering from an infectious condition (such as kennel cough). It is important not to pass on fleas or illness to other dogs or cats that I am treating. Please wait until the fleas have been treated or the illness has passed before making an appointment. Your pet's vaccinations should also be up to date. This protects your pet, as well as other animals. I perform massages at the dog's or cat's home. Make sure you have a cool, quiet room available with space on the floor for my massage bedding. Some dogs and cats are willing to sit in my lap, so in this case, they can be massaged on a couch. It is important to create a calming atmosphere with no interruptions (human or other pets) so your dog or cat can receive the full benefit of the treatment. Be aware that some dogs and cats are nervous for their first few massages and may take a while, even a few sessions, to relax. This is normal. A session may vary depending on tolerance and how much massage your animal feels they need. As more sessions are done the animal's tolerance usually increases. Be aware that your dog or cat may be thirsty or sleepy after the first few massage sessions, as their body is adjusting. I recommend a minimum of three-four sessions be done to start seeing results. Number and frequency of sessions will be discussed at your initial consultation. Please note that 24 hours cancellation notice is required. All massage sessions include any necessary acupressure and/or colour therapy, and home care plans. Travel to your home (within the Toronto area) is now included in the listed fees. 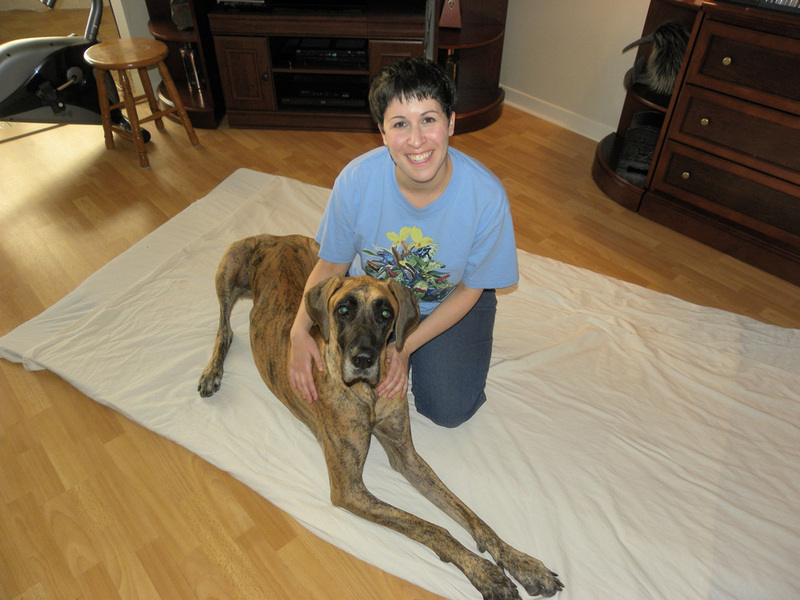 Regan with Shelby, a Great Dane.